Most of the time in our blog, we talk about Swiss watches, as Swiss watches are the vanguard of the watch industry. Everyone knows Rolex, for example, and Rolex is (obviously) an incredible watch brand. We admire, and repair many Rolexes here in our New York City shop. Other watch brands like Tag Heuer, Breitling, and Hamilton are also “common,” but by “common” we don’t mean “commonplace” but just that, to be honest, these big brands are the bulk of watches out there. It’s not dissimilar to how there are many, many BMWs and BMWs are wonderful, luxury vehicles but there are very few Ferraris, also great vehicles. (Everyone should own both a BMW and a Ferrari). 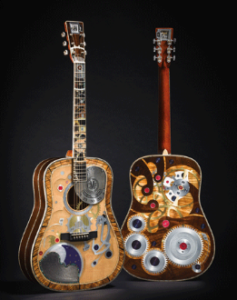 The 2,000,000th Martin Guitar was a very special project; that guitar will find its home in the C.F. Martin Museum at the factory in Nazareth, PA. The D-200 Guitars are inspired by the Two Millionth and will be limited to just 50 pieces. Each D-200 guitar will be delivered with a brand new RGM watch that was designed to go with the guitar. The dial has a larger opening in the center to give you the feel of a guitar’s sound hole. Exquisite Inlay. The intriguing aspect of the guitar is the use of a watch motif to mark the anniversary, replete with decorative gears, guilloché (a process of cutting geometric patterns into metal), decorative inlays and a working watch embedded within the headstock. Wowww….you’ve made Incredible History. I own 3 out of 2,000,0000++ which are Martin 000-18 Authentics 1937, OMC-41 Richie Sambora Limited Editions, D-18 GE Sunburst. Thanks Chris Martin and folks to build this amazing history. I do like the 2,000,000th design with the watch mechanics!!! Congratulations to everyone at Martin Guitar! It’s a beautiful work of art!. I treasure all my Martin Guitars. D-15 Custom, D-15 Acoustic Electric, DX1 and my LX1. One day I look forward to getting a D-18. When you’re done watching the video, and reading the comments, stroll over to the RGM Watch Co website at http://www.rgmwatches.com. This isn’t an old company; it was founded only in 1992, but it’s an incredibly interesting company and story of the birth / rebirth of the American watch industry. It’s a testiment to how “growing” the watch industry isn’t one ‘against’ the other; it’s not Rolex OR RGM Watches – it’s ROLEX ** AND ** RGM Watches. The founder, Roland G. Murphy, for example, received training at WOSTEP, the Watchmakers of Switzerland Training and Educational Program. After WOSTEP he was hired by SMH to work in product development for the Hamilton Watch Co. in Lancaster, PA. After a few years he was promoted to Technical Manager; he remained there until he started RGM in 1992. You can watch an introductory video on RGM Watch Co, here. As anyone passionate about watches (or cars, or guitars) can tell you, passion knows no nationality. You can admire a BMW, but be passionate about Tesla. You can admire different types of guitars, whether they were made in America or not, and you can certainly admire watches of all shapes and stripes. Among our most popular brands are, of course, Rolex, but that doesn’t mean we don’t admire (and repair) Rado or Tissot. It’s not either/or thinking, it’s both/and. So, if you have a passion for watches, we recommend you watch the video, take a look at RGM Watch Co, and own more than one watch. Another reason? If you own more than one watch, while we’re repairing, upgrading or just doing routine maintenance on one watch, you can be wearing your other one(s). If you’re in need of watch repair, give us a call or stop by our New York City watch repair shop!